Organizations from across Washington come together to stand up for Puget Sound’s future. Innovation Stories show how state government and partners invest to keep this place great. Puget Sound is a diverse ecosystem that nourishes Washington's health, economy, and quality of life, but human actions over the past century have damaged water and habitats. The natural resources on which people depend are in danger, and pressures on the ecosystem continue to increase as the population grows. Southern Resident orca whales are starving and Chinook salmon are struggling to survive. Some fish and shellfish are too contaminated to eat, which jeopardizes human health, local fishing, and the jobs that the shellfish industry supports. Led by the Puget Sound Partnership, multiple entities are collaborating to restore Puget Sound health, including state and federal agencies, tribes, local jurisdictions and non governmental organizations. The Puget Sound Vital Signs track progress on recovery goals of Puget Sound. Adult Chinook Populations – Fourteen percent of the 22 populations of Puget Sound Chinook salmon have increased in size compared to when they were listed as threatened in 1999. Population size is measured as the number of natural-origin fish returning to spawn naturally, and is reported annually to the Washington Department of Fish and Wildlife Chinook salmon depend on Puget Sound invertebrates and forage fish to fuel the growth that enables them to journey to the Pacific Ocean. Chinook salmon are the preferred prey of Southern Resident orca whales. Toxic Chemical Pollution – Forty-two percent of river systems show levels of toxic chemical pollution that increase health risks to juvenile Chinook salmon. As they grow, Puget Sound Chinook salmon continue to accumulate toxic chemicals, which poses health risks to predators, including Southern Resident orca whales. Most toxic pollution in the Puget Sound is carried by stormwater that runs off paved roads and driveways, rooftops, yards and other developed land. Development of Ecologically Important Lands – Thirty-one percent of recent development around the Puget Sound reduced tree cover on ecologically important lands. This causes harm to Puget Sound by conveying toxic chemical pollutants, fragmenting habitats, and degrading and disrupting the ecosystem processes that form and sustain habitats. These land use changes pose risks to Chinook, other salmon, and all the species that depend on them, such as Southern Resident orca whales. Puget Sound Action Agenda is the product of collaborative discussions and planning by hundreds of diverse partners and describes local and regional strategies, as well as the specific actions needed to recover and sustain the Puget Sound ecosystem. Puget Sound Innovation Stories provide examples of specific actions that state government and partners are conducting. 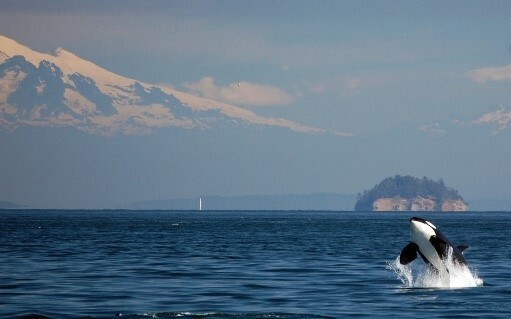 Multiple organizations participated in the Task Force effort to save the Southern Resident orca whales from extinction, including restoring Puget Sound salmon habitat, reducing pollutants, and reducing threats from vessel traffic and underwater noise. Gov. Inslee's 2019-21 budget takes big steps to save Southern Resident orcas and Chinook salmon. His operating, capital and transportation budgets for the biennium include a combined $1.1 billion in investments that will help ensure a thriving and resilient orca population. Besides helping orcas, these investments will have significant benefits for the region’s entire ecosystem and complement efforts to recover salmon, tackle climate change, improve water quality and more. The Washington State Department of Ecology has multiple efforts to assist in cleaning and restoring Puget Sound. The Puget Sound Nearshore Ecosystem Resotration Project is a partnership with the U.S. Army Core of Engineers Washington Department of Fish and Wildlife where they are working to comprehensively assess the 2,500 miles of Puget Sound Shoreline. The Southern Resident Orca Task Force was created in 2018 with the purpose of ensuring a healthy and resilient ecosystem that supports a thriving Southern Resident orca population and prevents its extinction. In November 2018 they issued their report with 4 recommendations to support a thriving southern resident orca population.